A cold front has moved in and the garage temps were so low that Friday’s scarfing hadn’t quite set. 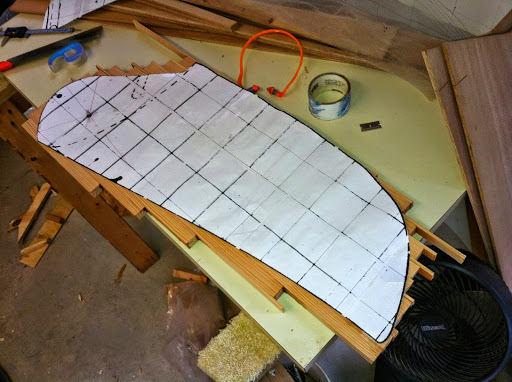 So, I fired up the kerosene heater and began work on the rudder foil. I elected to make the bladed out of epoxy laminated douglas fir. 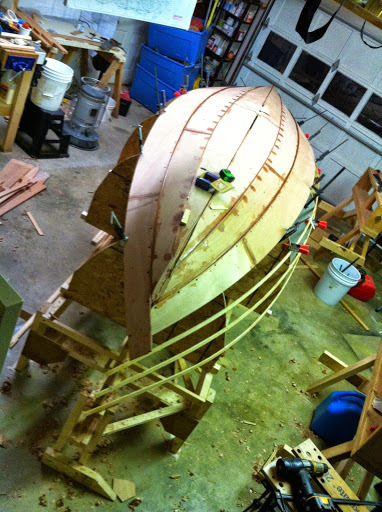 No real reason other than I thought this plywood boat deserved something other than plywood foils. 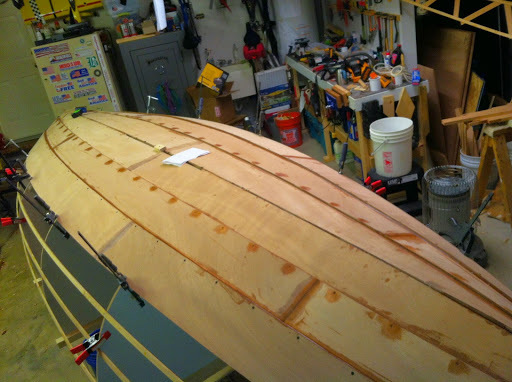 From a 5/4 x 3x 10′ board I was just shy of completing the rudder’s width. 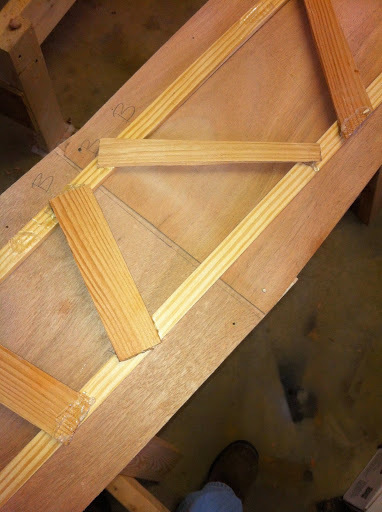 Since I had some cut offs from the spar staves, I slipped those in to complete the required width. End grain was altered to eliminate any warping of the final blade. I also am planning to glass the whole affair as added protection. My intention is to varnish the end result. 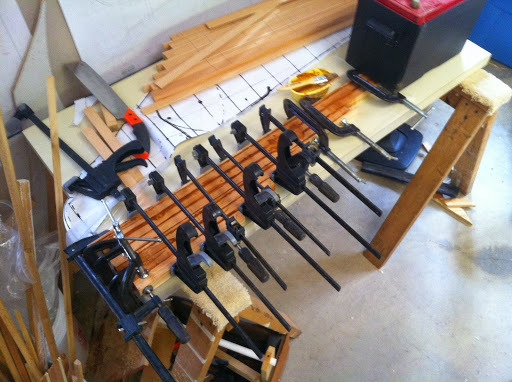 since my planer is limited to 10″ widths, two halves were glued up, planed and after a pass through the jointer, glued together. A full sized template helped in the layout. I’ve bought new blades for my 9″ Skil bandsaw and I’ll be curious to see how well it cuts. The blade that came with it was rot. It dulled after a few cuts in plywood. We’ll see what Bosch blades do. Otherwise the planking went on. I’ve got it down now. 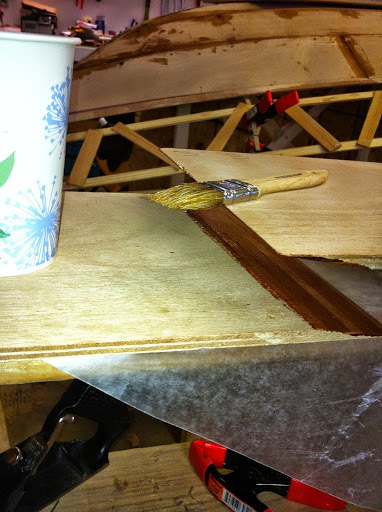 The laddered batten templates are very accurate. 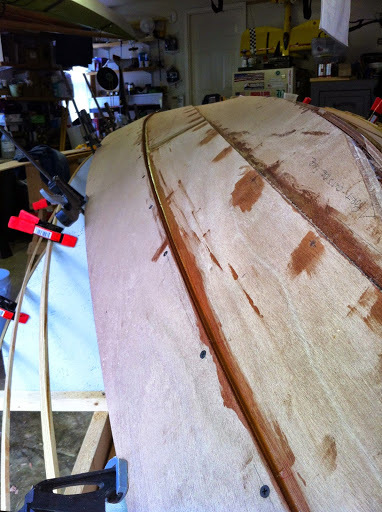 I cut 2 full planks at a time taking care to just skirt the penciled trace of the template. Judicious use of the jack plane and belt sander provides a gentle curve. The beveling and cutting of gains has now got a rhythm too. Waiting for the epoxy is what is holding back now, but I do glue both plank stocks at the same time. Stock laid out and template set to confirm fit. Nails in pilot holes confirm positions of scarfs. wetting scarf before thickened epoxy. 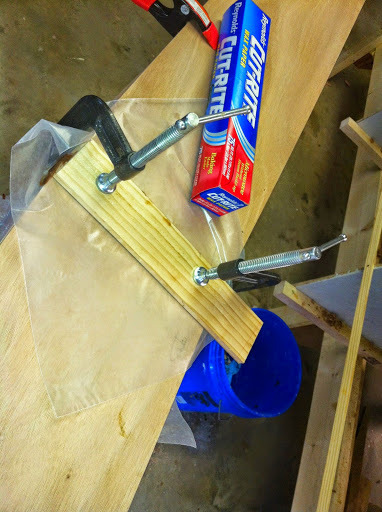 Wax paper separates 2 planks for simultaneous clamping. I dorked the corner of 2 scarfs. Luckily they are outside the final plank outline.The Manning benches are awesome. At 36″ they handily make a convenient work surface and can be easily maneuvered for planking operations. Perfect height. Slipping a block of wood under one plank panel helps register the joint with the nails mentioned above. There is also adequate room for slopping in the thickened epoxy after the initial wet-out. I’ve noted some don’t bother with this step, but I want as deep a bond as possible. I’ve now 1/2 a hull. 3 planks on, 3 to go, and number 4’s stock is curing. Went back to drywall screws. Epoxy distorts appearance, but boat is true so far. 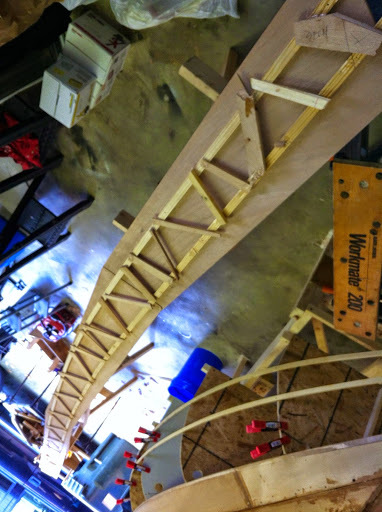 Not pictured, but started are the centerboard case and the planing for the outer stem and keel. Again, I climbed up on the boat to work. She is sturdy. I expect to be done planking come Thanksgiving. I’d like to show her off to family then. Ah, one other thing to note. I gave up on washered screws to pull the planks together. The washers sometimes stuck in the epoxy taking bits of wood in their removal. Drywall screws leave a conical hole which I rationalize is easier to fill and offers more surface area for the epoxy to fill and stick to. … OK! its easier too. What’s wrong with that?